According to the research of MGI and McKinsey’s Business Technology Office, it has been found that the big data act as the key of many important issues such as consumer surplus, innovation, competition any many such allied things. MGI analyzed big data in the five domains such as healthcare, public sector, retain, manufacturing and personal location data in various countries all over the world. Using the full big data, a retailer can increase the operating margin by at least 60%. Big data in the health care play a crucial role. If it can be implied properly, the yearly turnover can be outstanding. In some countries, for example, European countries the Government administrator can successfully save huge money in operational improvements just by using big data. 1) The importance of data in the industrial sector has become equivalent to labor and capital it as estimated that by 2009, all sectors of US economy would have an average of 200 Tb soared data per company, having thousand employees. 2)”Big Data” can create value mainly in five broad ways, firstly data can make information transparent at much higher frequency hence unlocking critical values. Second, as more organizations resort to digital storage of data they can gather and produce more accurate and detailed information’s. Third, big data allows narrower segments of customers, and therefore, much more precisely manufactured products or efficient services. Fourth is sophisticated analytics, which can improve decision making substantially. Finally big data can take you to the next level of services. 3) The growth of individual firms will depend largely on their use of big data in the future. 4) The use of big data can generate consumer increase as according to the research conducted a retailer can have almost 60 percent increases in his operative margins. 5) The gain due to big data varies from sector to sector depending on the type of industrial work carried out, mainly the computer and electronic products. This also includes information sectors, finance and insurance, and government which are the most likely ones to make the most out of this. 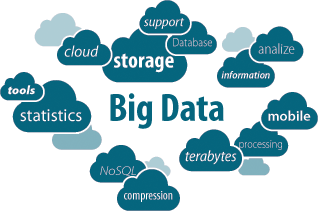 6) There will be a shortage of talent who can analyze big data in the future which will lead to rise in demand. 7) As every coin has two sides there are several issues related to “Big data”, which must be addressed to capture its full potential which includes privacy, security and intellectual property. Industries have to take care of this. More or less, all the companies of different sectors try to use the big data at its best. Few benefit from the big data more than others. Sometimes the productivity of certain companies of different sectors is compared in accordance to obtained value from the big data. As a consequence, the opportunities and chances that have been collected from different sectors must vary from one to another. Many sectors such as finance, computer, electronics and many others of private and Government are presumably supposed to gain from the wide use of the big data. When there is an immense possibility of gain, there is a shortage of talent who successively can make the best use of this. For making the effective solution, the analysts and managers should know about the all the relevant results, but fundamentally, most of them are lack the deep knowledge and proper skill. To capture the best potentiality of the big data, it is needed to be addressed by the security, privacy and the intellectual properties. Besides, arranging the excellent talents, the companies also need some effective and organized work flow.